Ryan began his Mixed Martial Arts journey over 20 years ago as a teenager, when MMA was quasi-legal, and a career in Martial Arts was rare. His first MMA fight was in February 1997 at the age of 19 -- since then, he has gone on to compete in the UFC, Strikeforce, Bellator, VFC, SportFight, etc. Still an active competitor, Ryan enjoys coaching as much as competing, and is excited to play a role in developing the next generation of MMA champions. Ryan and his two business partners formed Premier Combat Center in 2009, with the goal of bringing all the components of MMA under one roof -- Boxing, Wrestling, Kickboxing, Brazilian Jiu-Jitsu, Judo, Strength & Conditioning, etc. All with the best coaches and facility in the Midwest. That goal has evolved to include using and sharing his knowledge of martial arts in order to help others reach their fitness, martial arts, and life goals. Ryan is the Head Coach of Premier Combat Center's competition MMA Team, as well as the Lead Instructor in the Adult MMA program. In addition, he is an Assistant Instructor in the Youth MMA and Brazilian Jiu-Jitsu programs, and Assistant Instructor in the Adult BJJ program. Two Week Trial for $29.95 + Starter Kit & DVD! Jose Campos began Boxing at the age of 16, with 28 amateur matches, as well as 20 years of competition and coaching. Campos spent 4 years coaching with Esaul Diegues, coach of Omaha's own, WBO World Champion, Terence Crawford. He has coached numerous City and Regional Golden Gloves Champions. At the Ringside Amateur World Championships, he has coached 3 runners-up, and 2 World Champions. Six of Jose's students have been ranked in America's top 15, and four have competed in the USA Boxing Olympic trial tournaments. 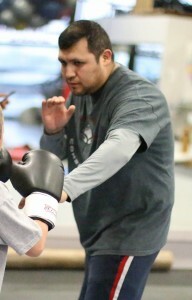 Coach Campos’ love for Boxing and his students is evident in the way he coaches. He is extremely dedicated to helping his students reach their potential, whether it be for self-defense, for fitness, for competition, and everything in between. Tony Eduardo is a third degree Black Belt in Brazilian Jiu-Jitsu (BJJ) under the instruction of Rilion Gracie. He began his BJJ education at the age of 12 with the renowned Gracie family, and has over 23 years of training with MMA and Brazilian Jiu-Jitsu legends such as Renzo Gracie, Ralph Gracie, and Royce Gracie. Eduardo has won numerous medals and titles in competition, including ADCC trials Champion, Asia Open Champion, 7x South Brazilian Champion, American National BJJ Champion, South American Champion, and 2x Brazilain Jiu-Jitsu World Championship Bronze medalist. Tony comes from a Law Enforcement/Military family, spanning more than 20 generations in Brazil. With more than 20 years of armed and unarmed combat experience, he is an active competitor in shooting sports, and has won the IPSC National Brazilian Championship twice. As a certified pistol, shotgun, and rifle instructor, Eduardo teaches weapons manipulation courses and unarmed combat to Brazilian Police special units, elite military forces, and Law Enforcement around the world. Professor Eduardo has partnered with MMA legend and UFC Hall of Fame member, Royce Gracie, to run a weapons retention program in Brazil. Their curriculum is focused on self-defense and unarmed combat. Most recently, Gracie and Eduardo taught their program to Navy SEALS in Coronado. Eduardo has dedicated his whole life to the training and instruction of Brazilian Jiu-Jitsu, in several countries around the world. His teaching concepts are focused on the intelligent use of leverage, strategy, and the warrior mindset.